• I came to the conference with the phrase ‘Equality and Empowerment’ firmly rooted in my mind but actually left mulling over the concept of ‘Equality, Equity and Empowerment’. Having reflected on this, not only do I buy into the notion of equity in co-production but have realised that the co-produced project I am working on with Rebecca has already grown organically to encompass the ‘Three ‘E’s’ from inception through to delivery. I am not just given work to comment on, but contribute from the beginning, sharing, analysing concepts and rationalising the data to the extent that outcomes are both effected and affected in a beneficial/positive fashion by this input. • When properly perceived, co-production, should be instigated from the outset, otherwise the danger exists of tagging on a few cursory third party/public comments to any body of research, thereby denying the whole initiative and undermining the concept, and I believe, the precepts of co-production. It should instead, perhaps scarily for some academics, be a ‘bottom up’ organised concept, not a ‘top down’ process. • Ultimately, the co-production event reinforced for me that co-production isn’t just acceptance of some gold standard of transformative set rules but an acceptance that it is a ‘buy into’ philosophy, a fearless understanding and embracing of the notion/concept that the more you inject from inception, the more you will harvest as reward. A true realisation of ‘Equality, Equity and Empowerment’. • Finally, a note; if co-production is accepted as the way ahead in many fields of research, it should always be remembered that academic work has stepped firmly into the public arena…and not just as a means of ensuring access to public funding. The existence of research as co-production within the public domain should not result in obscure contextualisation, i.e. only shaped and defined by those in elite positions typically clinicians, researchers and academics. If the context of research continues to exist in the domain of the elite only, then one of the major benefits of co-production, namely accessibility, will become lost. • Firstly, the language people use is really important, and often provides an insight into their co-production approach or ethos. However, as acknowledged by Simon Denegri, co-production isn’t yet in many people’s language. I wonder if this is due to the relatively new and emerging field of co-production in research, or a lack of understanding/guidance on how to achieve authentic co-production, or a reflection of the difficulties sometimes encountered when co-producing research as a result of archaic and restrictive policies/guidelines. Some people at the event also raised some really interesting questions about the danger of adding another ‘layer’ or ‘level’ of research i.e. participation, engagement, involvement and co-production, with the boundaries between such levels often highly blurred. There may be a risk of over-complicating co-production by getting hung up on issues of semantic intricacies. As identified by Simon Denegri, issues of what we should call co-production/public involvement is really a question without an answer. 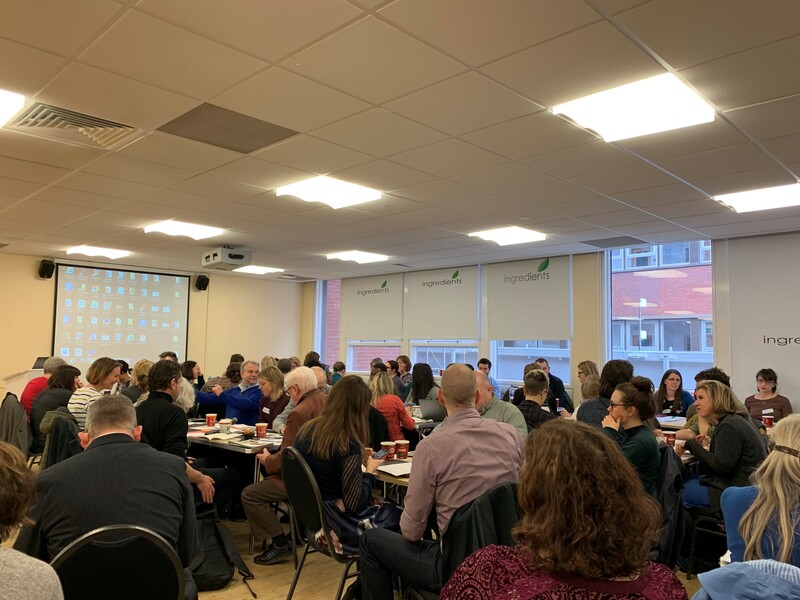 From my perspective, and I think many people in the room voiced the same, how you work well with patients and carers throughout the research process is essentially about relationships and conversations. What are people gaining from this experience? Is it a reciprocal relationship – are you learning from each other? This is the important element to focus on regardless of what you call it. So maybe, the language we use actually isn’t important and it’s about what you do! • Another interesting point raised at the event was whether co-producing research is truly empowering or emancipatory – are we allowing people to break free from things whether that’s definitions, processes or ‘rules’ that confine their influence and ability to influence change? There were some really interesting discussions that research sometimes only empowers, or creates the illusion that people are empowered within pre-determined restrictions that are often perpetuated, intentionally, or unintentionally, by academics and the institutions they work in. Is this perhaps an unexplored or ignored area of power in co-producing research? It was debated that it is the latter element of emancipation that we should be striving to achieve and this is something that has left a lasting impression on me. • The other reflective point came from a discussion I had with John on the way up to the co-production event. John (patient research partner) described how he used me and my experiences to gain something for himself, namely confidence, physically and mental well-being, pride, and a sense of ownership that had been missing for many years Initially the phrase really surprised me as the language we often hear is researchers inappropriately ‘using’ patients, and I felt like John’s comments really turned this traditional power dynamic on its head, and rightly so! Rather than the traditional view of the researcher ‘taking’ from a participant, John, an integral partner in the research takes from me, feels comfortable saying and acknowledging this, and views it as acceptable, or the ‘new’ norm. While some may view this idea with discomfort because it disrupts the status quo, I see it as a reflection and even a celebration of the transformative and reciprocal power of our co-produced research. Everyone should be benefiting from the research process. • Finally, the overwhelming feeling I had when leaving the co-production event was that there are a lot of people doing fantastic work in this area. It’s exciting and really encouraging to see. There is an emerging network, or community of co-producers from different disciplines, backgrounds and experiences, which is invaluable and we should make the most of. While there are of course some barriers and obstacles to overcome including how funders view co-production, and require co-production to be written into bids before the co-production has had a chance to develop, I think we are heading in the right direction with an exciting journey ahead of us. When John and Rebecca were presenting, you could see the genuine trust and bond that has built over years of working together. It made me feel warm watching them as a truly equal and united team. They had so much rich information to share, when either of them got a bit lost, the other supported them to get back on track. You could see the positive impact co-producing together had on each other. If only there were more relationships like this, but they take time to develop! • The research/healthcare system needs to be disrupted in order for us to do co-production well. In the current funding landscape, metrics that decide if a researcher or research centre is successful is how many high impact papers they have published, rather than whether they are meaningfully co-producing research or if their research is actually helping patients. • Could senior leaders stay for the whole meeting, so that they get to hear the rich discussions from people on the ground, so that those thoughts are fed into decision making at large organisations? • There is often thought that goes into training, support and a “buddy” scheme for public members involved in research. Do public involvement leads and researchers get the support they need to co-produce with patients and carers, in some quite emotional situations? • Is there a type of person who co-produces? How do we get more people to have positive experience co-producing, so we can get them to join the movement!? • There currently isn’t a huge amount of recognition for academics to do co-production. It’s also time consuming and a learning curve. They will have other pressures, so how can we get them to prioritise it more? Something that is mandated from funding bodies, can cause people to add a tokenistic title e.g. “co-production workshop” on to what is actually a consultation with patients. We shouldn’t be afraid of consulting patients to get their feedback, but we should be honest when something is not actually co-produced with patients and carers from start to finish. Co-production isn’t needed in all contexts/projects and that’s ok.
• Co-production is about how people feel and that needs to be captured. Did people feel valued and listen to? 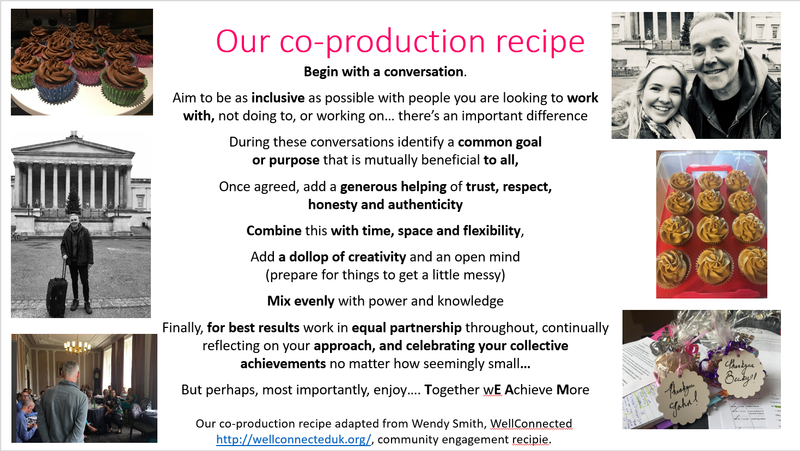 • One audience member mentioned that some of the tips about co-production were a bit “wishy washy” and it’s all very well having cake at a meeting, but they suggested that more people needed to be let in to the system. They felt only very privileged people, who know where to find opportunities and can navigate the system, actually get to co-produce and then eventually they become part of the system. How can we not remain has “heard to reach” researchers? • I liked John and Rebecca’s recipe for co-production. They suggested that you needed to remove assumptions, be singing from the same Hymn sheet and mutually benefit from the project. 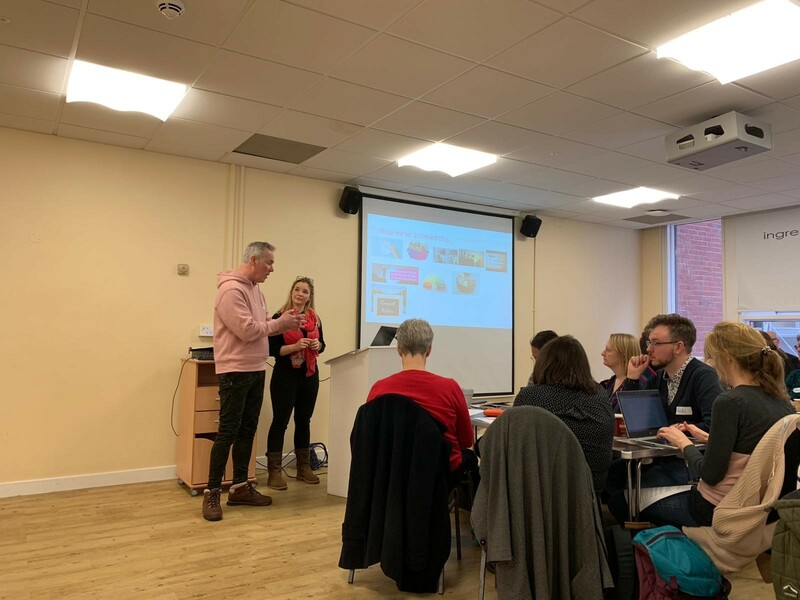 They said you needed to have co-produced ground rules, a neutral location time, faith, flexibility, reflection/feedback, recognise if things go wrong and have space to think/talk…and plenty of cake (and healthy snacks, of course)! • In order to address power differences and dynamics it is necessary to build open, honest, trusting and reciprocal relationships. One way to do this is to simply begin with an open conversation to identify a common goal. • Remain flexible to find opportunities for solutions and innovations that emerge from the relationships developed. • Everybody benefits from working together. This includes benefits to the research project and personal benefits to everyone working on the project (e.g., increased confidence, new skills). This event was sponsored by Centre for Public Engagement, Kingston University and St George’s, University of London; INVOLVE; University College London Centre for Co-production in Health Research; Academic Health Sciences Network (AHSN) for Kent, Surrey & Sussex; NIHR Research Design Service London. #How2Copro – Follow this twitter thread of the event for more info. #CoProEngland – Follow this twitter thread to explore the possibility of an English Co-production network (there is already one in Wales and Scotland) and if so what it should be about/how we should go about this.